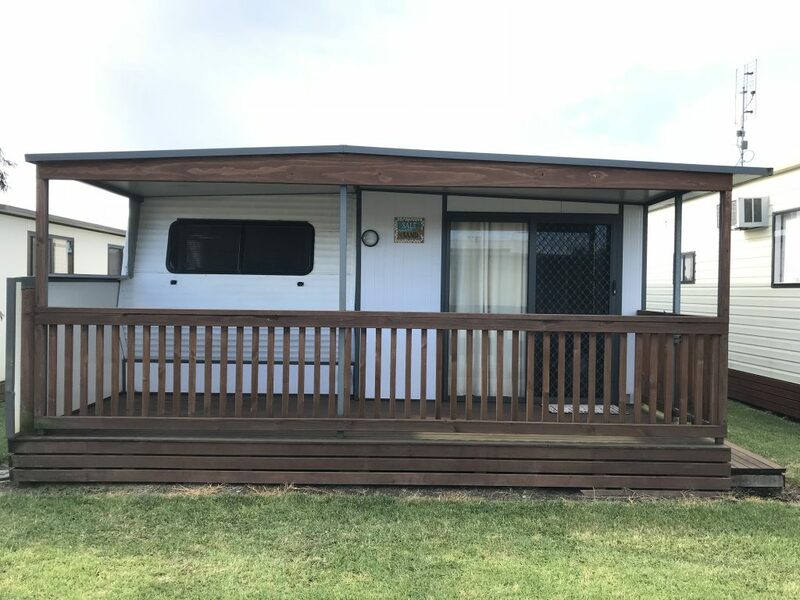 This 23’x 8’ Jayco caravan is beautifully converted to adjoin perfectly, with a split level step down, to a larger size fully compliant aluminium annexe (36’x10’) in excellent condition, sleeping 7 and is selling WIWO. With a light wood laminate flooring throughout, a large verandah & stained decking – which is fenced/gated – it’s perfect for the littlies to play safely! There are 2 separate bedrooms – one with a brand new white trio bunk bed (double bed below with a single bed above with safety rails), wardrobe, and an adjoining large bathroom, and the other bedroom with 2 sets of bunks and a tall white cupboard for clothing, etc. The master bedroom has its own entrance door to the large bathroom which has a large full sized separate shower with baby bath base – perfect for the littlies in the family, – plus a toilet and hand basin with cupboard storage underneath. This van is ideally located in a lovely, highly sought after peaceful area of the park with no through traffic, has no site behind it, and is close walking distance straight down to the oval. Owners are selling due to upgrading to a cabin within the park. If you are looking for a fantastic, very comfortable clean & tidy, larger than usual, spacious & well designed family holiday van/annexe, then this is one not to be missed!!!! A great holiday investment ready to go! – Just move in, relax and enjoy!!! Be quick, for this one won’t last long!